ABC Security supplies, installs and maintains automatic door systems from trusted names such as Besam and Camden Controls. As providers of complete door opening solutions, we can support your facility with everything from power door operators and universal washrooms, to access control integration. Automatic doors and universal washrooms can help your facility comply with accessibility standards like AODA. Industry studies show an overwhelming preference for automatic doors among the general public, not just those living with a disability. Save energy with intelligent automatic door features like low-energy operators and sensors that reduce airflow. We supply, install and maintain a wide range of automatic swing and sliding door solutions from top manufacturers. If you don’t see what you’re looking for, we’d be happy to help you find the right product for your needs. The Besam SW100 is one of the most intelligent swing door operators available on the market and its low-energy performance means it can be a very cost-effective option for automating a swing door entrance. Battery backup and monitoring ensures operation even when the power is interrupted, while an intelligent locking function adds security. Safe, reliable and near-silent operation makes the Besam SW100 an ideal choice for applications in healthcare, residential, private office and public service environments where both low-noise and ease of access are important. 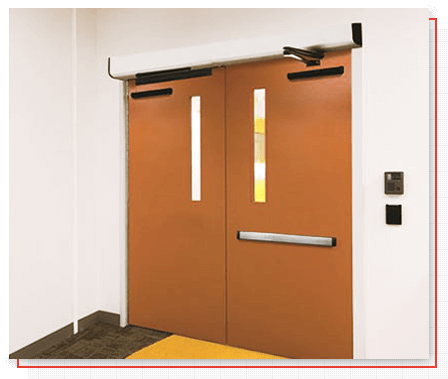 Designed to seamlessly handle the many unforeseen conditions that exist in buildings, this field-adaptable, low-profile power door operator can be easily installed in new constructions or retrofitted to most swing doors. Besam SW200i surface-mounted door operators feature an intelligent and flexible design that offers superior performance in varying environments and conditions. The heavy-duty electro-mechanical operator is suitable for use on large heavy doors, yet adaptable enough to be used in low-energy applications. 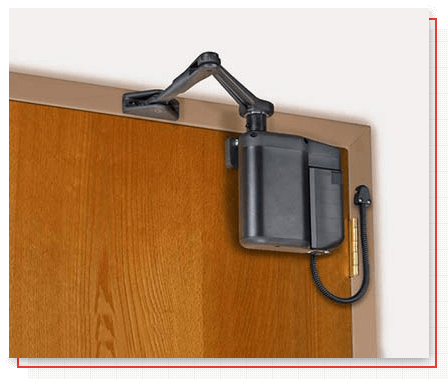 The 5800 Series ADAEZ PRO PLUS is a compact door operator that is simple to install and use. This heavy-duty, low-energy operator is intended for high-traffic applications that require continuous duty automatic operation such as schools/universities, banks, retail outlets or hospitals. This operator includes a 24 VDC hardwired transformer kit that allows the non-handed unit to plug directly into an outlet. Featuring Push-and-Go and Power Close, the 5800 is available for push or pull mounting and ships standard with two RF wireless push buttons. Excellent solution for doors that have minimal to zero header clearance! 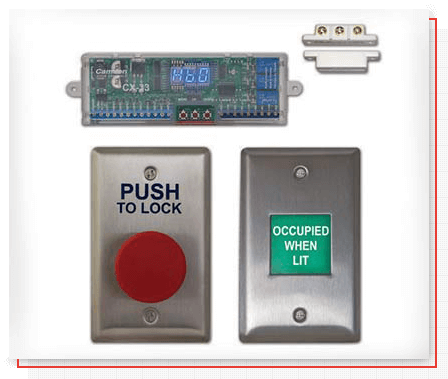 Camden Door Controls offers an industry-leading range of packages designed specifically for the control of automatic doors in restroom applications. (providing ‘OWL’ signage that is not legible when unit is not lit) CX-33 advanced logic relay (providing exclusive operation modes for restroom control) and Aura™ illuminated push plate switches (that combine ‘OWL’ annunciation and door activation in one product). Thanks to advances in technology, it’s never been easier or more cost-effective to upgrade to an automatic door system. 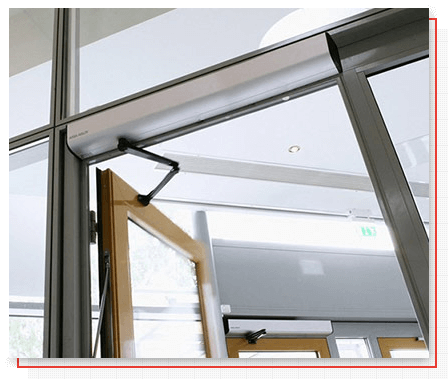 We have many years of experience retrofitting swing and sliding doors in a wide variety of environments, including hospitals, apartments, schools, shopping centers and commercial buildings. Before you dismiss an upgrade as out of reach, talk to a specialist at ABC. We’ll show you that with the right products and advice, an automatic door system is closer than you thought. When Raymond Doyle founded ABC in 1938, the company’s focus was on providing outstanding locksmith services. Although we’re proud to carry on our locksmithing tradition, ABC has expanded its focus to serve a diverse range of security and access control needs—from simple but effective mechanical solutions, to advanced electronic systems with complex integrations. As AAADM certified and trained technicians, we comply with the new American National Standard for Power Operated Pedestrian Doors, ANSI A156.10. For a quote or more information about our products and services, contact us today.